Explore hidden gems such as Zipline and Sterkfontein Cave. Your inner history buff will appreciate Union Buildings and Nan Hua Temple. Get out of town with these interesting Johannesburg side-trips: Historic Motorcycle Museum (in Deneysville), Pretoria (Melrose House, Sammy Marks House, & more) and Ukutula Lion Park (in Brits). And it doesn't end there: take an in-depth tour of Paul Kruger Country House Museum, take in the exciting artwork at Art Eye Gallery, browse the exhibits of I was shot in Joburg, and steep yourself in history at Kromdraai Gold Mine. For reviews, photos, maps, and tourist information, read our Johannesburg trip builder app . Berlin, Germany to Johannesburg is an approximately 16.5-hour flight. You can also do a combination of train and flight. The time zone changes from Central European Time (CET) to South Africa Standard Time (SAST), which is usually a 1 hour difference. In June in Johannesburg, expect temperatures between 22°C during the day and 5°C at night. Wrap up your sightseeing on the 17th (Mon) early enough to drive to Butha-Buthe. Butha-Buthe is the capital city or camptown of the Butha-Buthe District in Lesotho. 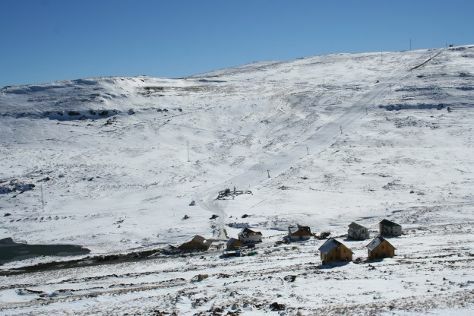 On the 18th (Tue), hit the slopes at Afriski Mountain Resort. For traveler tips, more things to do, other places to visit, and other tourist information, read our Butha-Buthe online journey planner . Drive from Johannesburg to Butha-Buthe in 5 hours. Alternatively, you can do a combination of bus and car; or do a combination of bus and car. Plan for slightly colder nights when traveling from Johannesburg in June since evenings lows in Butha-Buthe dip to 0°C. Cap off your sightseeing on the 18th (Tue) early enough to travel to Upington. Upington is a town founded in 1884 and located in the Northern Cape province of South Africa, on the banks of the Orange River. Kick off your visit on the 19th (Wed): tour the pleasant surroundings at Tierberg Nature Reserve and then take an in-depth tour of Kalahari-Oranje Museum. For traveler tips, where to stay, photos, and other tourist information, you can read our Upington online holiday builder . Traveling by car from Butha-Buthe to Upington takes 8.5 hours. Alternatively, you can fly. Expect a bit warmer temperatures when traveling from Butha-Buthe in June; daily highs in Upington reach 25°C and lows reach 5°C. On the 20th (Thu), you'll travel to Cape Town. You'll discover tucked-away gems like Phillipskop Mountain Reserve and !Khwa ttu. Your cultural itinerary includes sights like Fairview Wine and Cheese and Vergelegen Estate. Get out of town with these interesting Cape Town side-trips: Topiary Wines (in Wemmershoek), Spice Route Destination (in Suider Paarl) and Stellenbosch (Stellenbosch University Botanical Garden, The Rhenish Mission Church, & more). Spend a fascinating day underwater on the 27th (Thu) with a shark diving experience. There's lots more to do: see the interesting displays at South African Jewish Museum, do a tasting at High Constantia Wine Cellar, explore the striking landscape at Twelve Apostles, and kick back and relax at Bloubergstrand Beach. To find maps, photos, reviews, and tourist information, refer to the Cape Town trip planner . The Route module can help you plan travel from Upington to Cape Town. While traveling from Upington, expect a bit cooler days and a bit warmer nights in Cape Town, ranging from highs of 20°C to lows of 9°C. 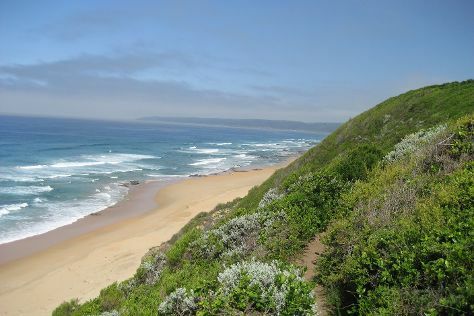 Wrap up your sightseeing on the 28th (Fri) to allow time to travel to Plettenberg Bay. Get in touch with nature at Garden Route (Tsitsikamma, Knysna, Wilderness) National Park and Knysna Lagoon. Holy Trinity Church and St. Christopher Catholic Church will appeal to history buffs. Explore Plettenberg Bay's surroundings by going to The Dolphin Trail (in Storms River), Tsitsikamma National Park (Storms River Suspension Bridge & Otter Trail) and Knysna (Old Gaol and Art Gallery, Knysna Museum, & more). There's much more to do: tour the pleasant surroundings at Lawnwood Snake Sanctuary, do a tasting at Plettenvale Wines, and pause for some serene contemplation at St Peters Anglican Church. For ratings, reviews, where to stay, and more tourist information, read our Plettenberg Bay trip itinerary planner. Traveling by flight from Cape Town to Plettenberg Bay takes 3 hours. Alternatively, you can do a combination of flight and bus; or drive. Expect a daytime high around 22°C in June, and nighttime lows around 12°C. Cap off your sightseeing on the 5th (Fri) early enough to go by car to George. Visiting Shark Diving and Zorgfontein Game Farm will get you outdoors. Get some historical perspective at Dutch Reformed Mother Church and Montagu Pass Old Toll House. Explore the numerous day-trip ideas around George: ReedValley (in Mossel Bay), Oudtshoorn (Arbeidsgenot & St Jude's Anglican Church) and Hartenbos (ATKV’s Hartenbos Museum & Janine Iron and Washing Museum). Spend the 9th (Tue) exploring nature at Wilderness National Park. There's lots more to do: see the interesting displays at Outeniqua Transport Museum, take in the exciting artwork at Cape Palette Art Gallery, explore the activities along Kaaiman's River, and stroll through Wilderness Beach. To find other places to visit, more things to do, and tourist information, you can read our George trip maker site . Drive from Plettenberg Bay to George in 1.5 hours. Alternatively, you can take a bus. Expect little chillier evenings in George when traveling from Plettenberg Bay in July, with lows around 8°C. Wrap up your sightseeing on the 10th (Wed) early enough to travel to Durban. Visit The Buddhist Retreat Centre and St Luke's Anglican Church for their historical value. Take a break from the city and head to Shark Diving and Harold Johnson Nature Reserve. Change things up with these side-trips from Durban: Zipline (in Port Shepstone), Scuba & Snorkeling (in Umkomaas) and Barn Swallow (in Mount Moreland). Spend the 14th (Sun) among lush scenery at Royal Natal National Park. There's lots more to do: admire the architecture and history at The Ramakrishna Centre of South Africa Durban, get your game on at Epic Karting Galleria, contemplate in the serene atmosphere at Hare Krishna Temple of Understanding, and ride a horse along Stormy Hill Trails & Tails. To see maps, photos, reviews, and other tourist information, read our Durban travel route planning app . You can fly from George to Durban in 2.5 hours. Alternatively, you can drive; or take a bus. Expect a bit warmer temperatures when traveling from George in July; daily highs in Durban reach 27°C and lows reach 16°C. Finish your sightseeing early on the 16th (Tue) to allow enough time to travel to Hazyview. Get some cultural insight at Matsamo Cultural Village and Barberton History & Mining Museum. Step out of the city life by going to Elephant Whispers and Panorama Route. Get out of town with these interesting Hazyview side-trips: Bourkes' Luck Potholes (in Moremela), Nelspruit (Sudwala Caves & Jane Goodall Chimpanzee Eden Sanctuary) and Graskop (Panoramic Route Mpumalanga & Wonder View). And it doesn't end there: see exotic creatures in open habitats at a safari tour, admire the sheer force of Lone Creek Falls, get to know the resident critters at Elephant Sanctuary Hazyview, and take in the dramatic natural features at Three Roundavels. To see reviews, other places to visit, and more tourist information, refer to the Hazyview online travel planner . Getting from Durban to Hazyview by combination of flight, taxi, and bus takes about 3.5 hours. Other options: do a combination of flight and taxi; or drive. Plan for slightly colder nights when traveling from Durban in July since evenings lows in Hazyview dip to 11°C. Wrap up your sightseeing on the 23rd (Tue) to allow time to take a bus to Hoedspruit. Do some cultural sightseeing at Kingfisher Gallery and Ukuthula Designs. Step out of the city life by going to Hoedspruit Endangered Species Centre and Siyafunda Conservation. Change things up with these side-trips from Hoedspruit: Haenertsburg Cemetery (in Haenertsburg) and Qualito Craft Distillery (in Phalaborwa). 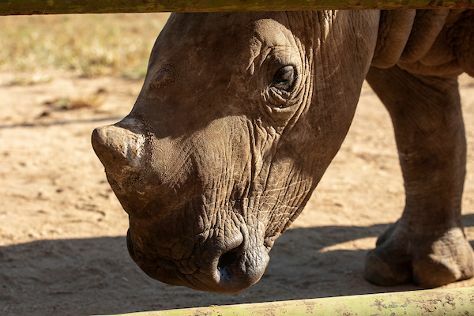 And it doesn't end there: tour the pleasant surroundings at Moholoholo Wildlife Rehab Centre, take an exotic tour of a safari tour, indulge in some personalized pampering at some of the best spas, and view the masterpieces at iNyoka Art Gallery. To see traveler tips, maps, other places to visit, and other tourist information, refer to the Hoedspruit road trip website . Getting from Hazyview to Hoedspruit by bus takes about 1.5 hours. Other options: drive. In July, plan for daily highs up to 26°C, and evening lows to 10°C. Finish your sightseeing early on the 27th (Sat) to allow enough time to travel to Kruger National Park. Get outdoors at Game drives at Phalaborwa Gate in Kruger National Park and Bushmans Trail. Next up on the itinerary: stroll through Sweni Wilderness Trail, take some stellar pictures from Nkumbe View Site, get outside with Wild Frontier Adventures, and explore the ancient world of Masorini Archaeological Site. To find photos, ratings, other places to visit, and tourist information, refer to the Kruger National Park visit planner. Getting from Hoedspruit to Kruger National Park by combination of bus and taxi takes about 2.5 hours. Other options: drive. In July, daily temperatures in Kruger National Park can reach 26°C, while at night they dip to 10°C. Finish your sightseeing early on the 1st (Thu) so you can travel to Musina. Start off your visit on the 2nd (Fri): stroll through Musina Nature Reserve and then examine the collection at Mapungubwe Museum. To see other places to visit, photos, reviews, and more tourist information, you can read our Musina tour itinerary planning website . Traveling by car from Kruger National Park to Musina takes 5.5 hours. Cap off your sightseeing on the 2nd (Fri) early enough to travel to Bela Bela. Taking a trip to Bela Bela allows visitors to enjoy mild weather and many hot springs. 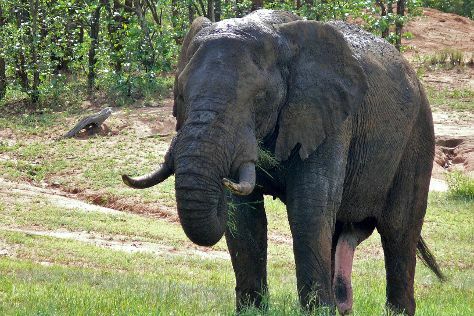 Step off the beaten path and head to Adventures with Elephants and Jugomaro Predator Park. Get outdoors at Welgevonden Nature Reserve and Mabalingwe Nature Reserve. Step out of Bela Bela to go to Vaalwater and see The Black Mamba, which is approximately 1h 15 min away. There's more to do: pick up some local products at L'abri Farm Shop and Brewery and admire all the interesting features of Geluksfontein Goat Cheese Farm. For more things to do, photos, other places to visit, and other tourist information, go to the Bela Bela travel route website . Traveling by car from Musina to Bela Bela takes 4 hours. Alternatively, you can fly. Expect a daytime high around 26°C in August, and nighttime lows around 4°C. You'll have a few hours on the 6th (Tue) to wrap things up before traveling home.